Lead with your strengths. It's a classic tactic in theatre and arts — an attempt to grab the viewers attention as early as possible. This triple ballet bill at Royal Opera House, instead putting its weakest piece at the front. 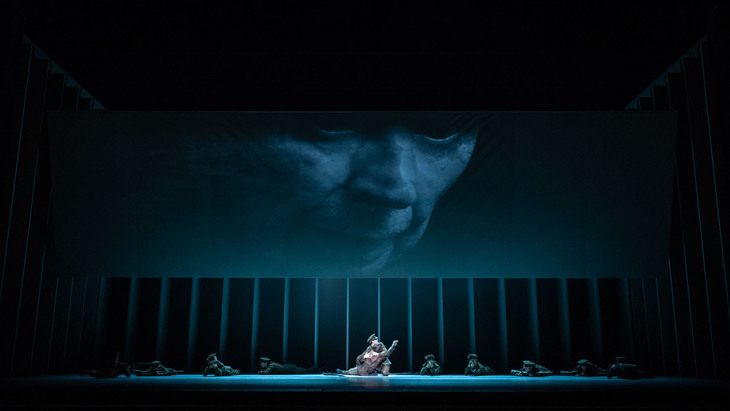 Unknown Soldier, the headlining performance of the Royal Ballet's latest mixed programme, takes the world war one centenary as subject for a new work choreographed by Alistair Marriott. It's all very high-tech, using video footage of veteran Harry Patch and the elderly Florence Billington, a woman who lost her fiancé in the war. These recordings are projected above the dancers at various points, creating a moving, although distracting, counterpoint to the dance. A mix of jazzy swing dance, beautiful classical ballet and military-style steps occupy the stage — the story itself is simplistic, and although the music is impressive, the whole piece feels a bit muted and unemotional, relying (and arguably overshadowed by) the real testimonies simultaneously presented to us. Infra, the second piece, is the highlight of the evening, perfectly showcasing Wayne McGregor's signature clever contemporary choreography. Suggestive of the quintessential urban anxiety and the fear of getting lost in a sea of people, Infra, with its grey costumes and arty digital displays, is a feast for the eyes. Bent knees, parallel feet and other shapes usually shunned by traditional ballet technique give a certain modernity and intentional awkwardness to the ballet. Despite premiering 10 years ago, Infra feels extremely current. Sharp, sparkly and precise, Symphony in C is the final offering of the programme, a classic Balanchine production in which white-tutu clad ballerinas and men in black velour demonstrate their incredible stamina, timing, flexibility and musicality. Bizet's pretty score complements the equally stunning choreography on stage. In contrast to Infra, though, it all feels a bit too perfect, too clean, too conservative. Although starting in a bit of a disappointing fashion, this mixed programme is testament to the unbelievable skill of the Royal Ballet. Drifting through genres, styles and music, it's easy to get lost in the sheer beauty and emotion of the dancing, even if the world war one piece left the audience unsatisfyingly dry-eyed.